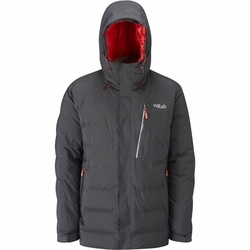 Rab Resolution Jacket. The Resolution is a unique fully waterproof box-wall down jacket, offering unrivaled levels of warmth and weather protection. In certain extreme environments, we know that a water-resistant down jacket isn't going to suffice - conditions can deteriorate rapidly and you end up dealing with precipitation as well as sub-zero temperatures. The Resolution uses the same reliable Pertex Shield fabric as featured throughout our Shell range, and the unique bonded box-wall construction allows for 330g of the highest quality 800FP down to provide exceptional levels of warmth. Key features include a down-filled helmet-compatible hood, a large internal stash pocket and waterproof YKK zips. All Rab Down products use ethically sourced European Goose down certified to Responsible Down Standard. This ensures that our entire down supply chain can be traced so consumers can be confident that all down and feathers used in Rab products adhere to the highest possible animal welfare and safety standards.